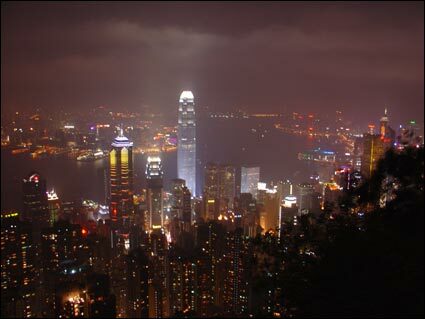 A one-year survey of the condition of light pollution in Hong Kong started in March 2008. Night sky brightness data using 36 Sky Quality Meters are collected by volunteers at multiple sites around the city at designated time. Excessive outdoor lightings in Hong Kong cause serious light pollution. 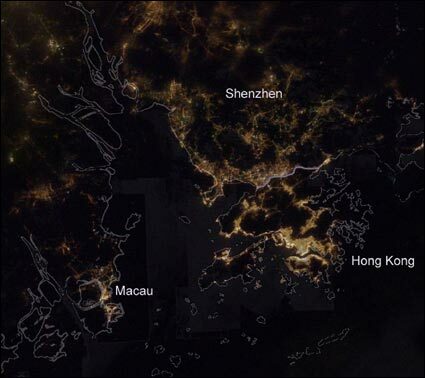 Night time photo of Hong Kong and the Pearl River Delta Region taken from a space shuttle in orbit. Urban centers on both sides of the Victoria Harbor and the rapid developments of the Hong Kong-Shenzhen border areas can be easily seen (Credit: NASA). Hong Kong, “the Pearl of the Orient,” is famous for its spectacular night lights. The flip side of this is that at the city center, one can only see a brightly-illuminated sky background but hardly any stars. With a densely populated city, the outdoor lightings in Hong Kong are omnipresent. With funding support from the Environmental Protection Department of the Hong Kong SAR government, in March 2008 the Department of Physics of The University of Hong Kong started a community-based one-year survey of the condition of light pollution in Hong Kong. In the survey, the night sky brightness is regularly measured citywide by volunteer project participants throughout Hong Kong using the Sky Quality Meters (SQMs). With these data, the distribution and properties of light pollution of Hong Kong, including the correlation between various environmental factors and light pollution, would be investigated. The collected data could also potentially serve as references for possible future developments of outdoor lightings regulations by the government. A total of 36 SQMs are used in the survey. Observers are advised to take measurements at 9:30pm and 11:30pm on 5th, 10th, 15th, 20th, 25th & 30th in each month (data collected on other times are also welcome). Observers are advised to record cloud and haze conditions of the night sky. Moonlight nights are acceptable. Observers are advised to select observing sites which is not directly affected by nearby artificial lightings and has a wide field of view. Observers report the SQM readings and the observing conditions through the survey webpage and they can access statistics of their submissions.